A few weeks ago, I was rummaging through my three binders of PDF patterns looking for a new fall bag pattern, but nothing was looking appealing. Finally, I decided to stroll around on Craftsy's pattern pages. For those of you unaware, Craftsy has a whole library of patterns that independent pattern makers have uploaded and sell. Some don't charge, most charge between $3 and $10. I came across a pattern from Swoon for their Bonnie Bucket bag and thought it would meet my criteria for an ideal bag: large- but not so large that it gets mistaken for a diaper bag, multiple fabrics used, but not an overwhelming amount, and easy on the yardage. So, I cut out and taped the pieces together. By the way, nice thing about this pattern is there's only two pattern pieces that need to be taped together, the rest all fit on a page. Then it took me a few days to decide on fabric, and get it cut out, and then it sat in a stack on my coffee table for about a week. Finally, on Wednesday I decided to get to work on it. The patten shows how to make a welt pocket for the exterior, which is something I had never tried before. Mine did not turn out perfect. You can see little bits of white interfacing showing through, but it was fun to try something new and outside of my comfort zone. I think it'll be a great place to stash my cell phone, so I don't have to rummage through my bag to find it every time it rings. I was applying the exterior bottom to the exterior sides, and the directions stated to be sure you were sewing it to the right end. I thought to myself, "duh, how could you mess that up", finished sewing mine together, flipped it inside out, and basted my handle in place only to realize I had done just that. Luckily, it wasn't too terrible to seam rip apart and start over again the right way. The rest of the bag went together very smooth. The zipper installation is a breeze with a zipper foot, and after attaching the lining (which I decided against interfacing and don't regret since I used fusible fleece to interface the exterior) you flip everything right side out, topstitch the top edge, and attach the handle. There's a couple things I'd change if I make this bag again. The main thing being not to use broadcloth for the exterior. love it because it's cheap and comes in a variety of colors, and while it's okay for linings, it just feels kind of chap next to the Anna Maria Horner fabric I used for my focal piece. I just need to quit being so cheap and invest in some Kona solids or something. I also made a booboo when I was cutting out my bag. The blue front and back should be kitty corer from each other as are the AMH pieces. I thought I'd be smart and cut them at the same time by just double layering my fabric. I don't think it looks bad or anything, but next time I'll cut mirror images. Do you sew? Or knit, or crochet, or quilt? 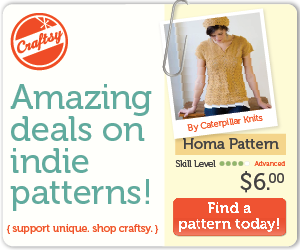 Check out Craftsy for some great patterns. There's some really amazing free patterns available. You can download and print to your little hearts content.